XOLO’s A500S and Micromax’s Bolt A67 continue to dominate the entry-level budget segment of smartphones in India. If you, like many others, are having a tough time trying to choose between the two devices, you’re at the right place; this post will help you choose either of the two devices based on your usage pattern. While Micromax enjoys a good reputation among domestic buyers, XOLO is fast catching up, which makes the competition even tougher. Let us go ahead with this war between smartphones for the common man! The weight of the Micromax Bolt A67 is known for certain yet, but it is estimated that the phone weighs somewhere between 120 and 130g. Speaking of the dimensions, the Bolt A67 can be seen as the bigger of the two with a larger footprint. The device is also thicker than the 9mm A500S, and measures 10.5mm thick which is on the higher side. The XOLO A500S packs a 4 inch screen with a WVGA resolution of 800×480 pixels, which churns out a respectable pixel density of 233 pixels per inch. On the other hand, the Bolt 67 features a slightly larger 4.5 inch screen which should be more usable. The resolution on the Bolt A67 is FWVGA (854x480p). On the display front, the Bolt A67 with its 4.5 inch screen would definitely be a better choice since activities like gaming, watching videos will not be very enjoyable on the 4 inch screen of the A500S. The XOLO A500S features a 1.3GHz dual-core processor from Mediatek, the MT6572W. On the other hand, the Bolt A67 comes with again a dual core processor, but clocked at only 1GHz, which means that the XOLO A500S will be the better of the two on the processing front. Both phones come with 512MB of RAM, which should be enough for the entry-level segment since people who buy these devices are expected to be first time smartphone owners. The XOLO A500S takes the lead here with its 5MP main shooter at the rear. The Bolt A67, on the other hand, features a rather disappointing 2MP unit. A 2MP unit about 5 years back would’ve been something new, but at this day and age, people really want something more advanced. We’re sure our readers know that megapixel count isn’t everything when it comes to phone cameras, but then that is the case when things go beyond requirement (>13MP). Both devices feature 4GB of ROM, which is very consistent with other budget devices. Both phones come with a microSD card slot, so one among the two cannot be chosen on the basis of memory. In this topsy-turvy of a comparison, here’s another twist – the battery. The Bolt A67 again takes the lead with an 1850mAh unit, whereas the A500S lags behind with just a 1400mAh one. Although the Bolt A67 comes with a larger screen, it still will have a slightly better battery performance because of the larger battery. Moderate users should see over one full day of usage on the A67, while with the A500S, a full day of backup would be considered good. 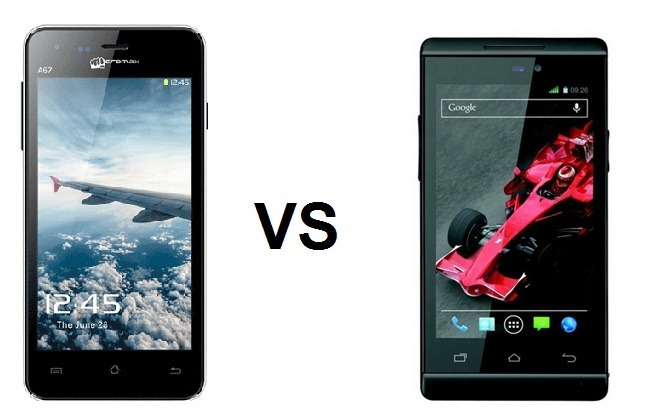 On the features front, the XOLO A500S comes with 3G whereas the A67 doesn’t which might be a decisive factor for some. We would advice you to go for a 3G enabled phone, since in the near future, 3G is expected to be affordable for all after with 2G speeds will seem very slow. Here are a few points to consider if you’re confused between the two devices – XOLO A500S has 3G whereas the A67 doesn’t; A67 has a bigger battery (1850mAh vs 1400mAh); A500S has a better camera (5MP vs 2MP). All in all, if you can live with a small screen and a small battery, the XOLO A500S would be the wiser choice. But if you want to have a large screen and a better battery life, you should go for the Micromax Bolt A67. in the above order which is best? min. 6 months use without any problem and good after sale service.